A memorable and entertaining show of balloons and magic! 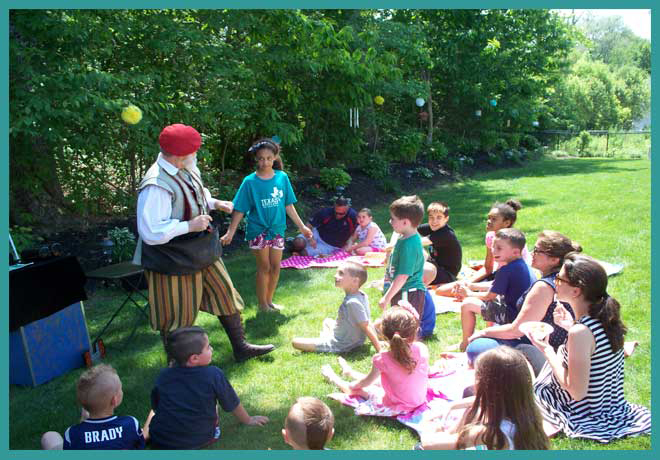 Bjorn has been professionally engaging audiences for over 25 years.He is a favorite among all age groups, and in high demand for children's party entertainment, as well as family and corporate events. Kids, adults and educators alike, love his show in which he combines magic and artful balloon making with a zany sense of humor. Make your next kids birthday party or organization's event a big hit, with Bjorn's Balloons and Magic! Bjorn has entertained at many different types of functions, from local kids birthday parties to government functions, and has captivated audiences ranging from half a dozen people to several hundred. He performs shows weekly throughout CT, RI and MA, and will work with you to make sure your party or event is truly one of a kind. In addition, Bjorn has a set of educational shows including (but not limited to) topics such as Safety, Dental Hygiene, Lean Green Eating Machine (Healthy eating), Self Esteem, I love America, as well as Holiday theme magic shows for Halloween, Christmas, etc. If you are an educator and want a wonderful magic show that supports your curriculum, then call this experienced and engaging performer today.